What better way to celebrate the holiday season than by giving back? That was IMRE's mantra this season, and the agency tapped the full resources of its more than 90 employees to make a difference in the greater community. What better way to celebrate the holiday season than by giving back? That was IMRE's mantra this season, and the agency tapped the full resources of its more than 90 employees in Baltimore, Raleigh, Los Angeles, and New York to make a difference in the greater community. At IMRE, one of our goals is to take the same passion and drive we have for producing great work for clients and apply it to goodwill endeavors. Being part of the IMRE culture means working together to help others. 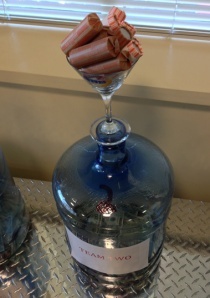 In November, IMRE held “Penny Wars” to support the Maryland Food Bank. IMRE split into three teams, each team tasked with filling up empty water cooler jugs with change and bills. The fun three-week contest ended up raising more than $3,500. In December, IMRE is hosting its annual “One Warm Coat” drive. Throughout the month, the Baltimore office will be collecting new and gently used coats to support a local family center. IMRE's Raleigh and Los Angeles offices are also giving back. The Los Angeles office is volunteering at the Los Angeles Regional Food Bank, as well as making a monetary donation. The Raleigh office is adopting two children as part of the Angel Tree program, which collects toys for kids in need.